Ema Tavola was born in Suva, Fiji – her father, Kaliopate is from the village of Dravuni, Kadavu and her mother, Helen is from Palmerston North, New Zealand. Spending most of her formative years in England and Belgium, Ema completed secondary school at Wellington High School in 1999. After two years of working in between Suva, Fiji and Wellington, New Zealand, Ema relocated to South Auckland to pursue tertiary studies in 2001. 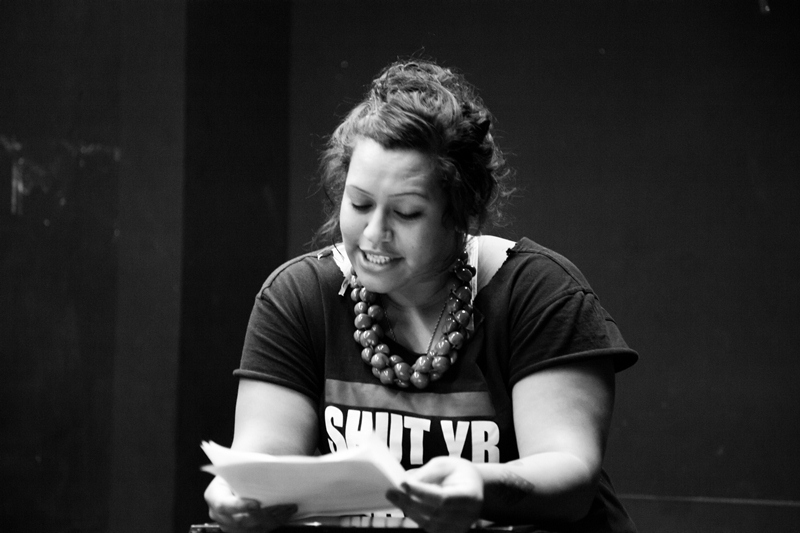 It was here she quickly became immersed in Pacific student body politics and volunteering with organisations such as Tautai Contemporary Pacific Arts Trust and Wahine Malosi. The gaps between Pacific audiences and gallery culture became the theme of her graduating dissertation; her art practice moved towards site-specific projects that engaged Pacific minds and sensibilities and the unique socio-political environment of Otara and South Auckland. Ema’s first curatorial project was a joint exhibition of portrait painters Samiu Napa’a and Reagan Iosefa Samoa entitled, The Artists are described as…Polynesian Male at Otara’s Artnet Gallery. Early opportunities to work under the leadership of the late Cook Islands curator, Jim Vivieaere proved influential and Ema went on to curate a series of exhibitions at Artnet before the gallery was closed in 2005. In 2006, she secured the role of Pacific Arts Coordinator for Manukau City Council. In what was largely an advisory position with a minimal budget, she was instrumental in the adoption of the old Artnet Gallery as a Council-operated Pacific arts facility. A series of community consultations ensured the community’s aspirations were reflected in the new facility’s ethos and Fresh Gallery Otara was opened in May 2006. Producing a new exhibition every three weeks, Fresh Gallery Otara became a turbine for new Pacific art set within the unique context of South Auckland’s dominant Polynesian urban environment. Utilising networks from art school, Tautai Trust and community relationships, Fresh Gallery Otara’s programming was varied and youthful. After working sole-charge for almost three years, an operational budget, additional full-time staff member and three year commitment to fund the Manukau Pacific Arts Summit were secured. Running from 2010-2012, the Pacific Arts Summit was a series of multidisciplinary events programmed around the Gallery’s anniversary. Noted nationally and increasingly internationally, Fresh Gallery Otara events became successfully integrated into the regional arts landscape, most notably with the 2011 Auckland Arts Festival exhibition, Ngā Hau A Whā – The Four Winds – a solo exhibition by Otara artist, Leilani Kake. Outside of Fresh Gallery Otara, Ema has developed curatorial projects for Te Tuhi Centre for the Arts and ARTSPACE and in 2012, performed the role of Associate Curator for Home AKL at Auckland Art Gallery. Ema was the Fijian Representative on the Pacific Arts Committee of Creative New Zealand from 2007-2011. In 2012, she established a freelance practice undertaking projects for various organisations including Auckland Council, Auckland Art Gallery, Toi O Manukau and Manukau Institute of Technology (MIT). She regularly lectures at tertiary institutions in Auckland and Hamilton and in 2013, started teaching a semester-long paper entitled, Pacific Art Histories: An Eccentric View at MIT Faculty of Creative Arts in Otara. Ema attained a Master of Arts Management degree from AUT University in 2013 and is currently working on freelance projects in between blogging and making art.